Ukrainian President Petro Poroshenko has signed the law on the transfer of the St. Andrew's Church in Kyiv to free and permanent use by the Ecumenical Patriarchate, according to the website of the Verkhovna Rada - Ukrinform. In particular, it is stated in the date and status of the passage of the document that the law was "returned with a signature from the president" on November 7. On October 18, the Verkhovna Rada passed the law transferring the St. Andrew's Church to the Ecumenical Patriarchate for free and permanent use. On October 11, the Synod of the Ecumenical Patriarchate decided to grant a tomos (ordinance) of autocephaly to the Ukrainian Orthodox Church. 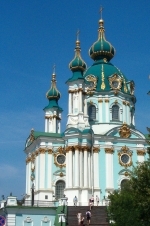 Kyiv now has to convene an assembly with the participation of the bishops of the Ukrainian Orthodox Church of the Kyiv Patriarchate, the Ukrainian Autocephalous Orthodox Church, and the Ukrainian Orthodox Church of the Moscow Patriarchate, who appealed to the Ecumenical Patriarch with a request for granting the tomos. The assembly will carry out the church unification, forming a single local UOC, and will elect its primate. After that, the head of the single local autocephalous Ukrainian Orthodox Orthodox will receive the tomos as a document (letter). President Petro Poroshenko and Ecumenical Patriarch Bartholomew signed an agreement on cooperation between Ukraine and the Ecumenical Patriarchate in Istanbul on November 3.